Ecologically minded brand, Burt’s Bees, has been busy broadening its range of natural personal care products, especially its skin care collection. To promote its new Intense Hydration line of moisturizing creams and lotions, the company recently created an innovative integrated marketing campaign featuring both traditional and digital advertising elements. The focus of the campaign was an event featuring a creative billboard design that clearly promoted the product and encouraged trial. Subsequent components included a video and Web banners on YouTube, along with blogger outreach, paid search advertising, and print advertising that offered visual and personal accounts of the product experience. MediaPost.com reported on the details of this creative advertising campaign that’s using a very innovative touch to make an Intense impact. “We created an event that would flip the typical before-and-after images on their head,” said Brian Berklich, the company’s senior marketing manager. 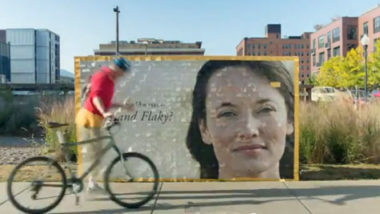 For this event, the company erected a low-standing billboard at a popular Minneapolis farmer’s market that appeared to be a woman with flaky, dry skin. Upon closer inspection, the flakes on her face were really 1,300 coupons that could be torn off by passersby to reveal the model’s smoother skin, coupon by coupon. The goals were to generate awareness and prompt consumer trial, which the billboard seemed to achieve since the model’s face was cleared of both coupons and dryness by the end of the day. The company captured the event on video and created a time-lapse version that they posted on YouTube. The video is now being supported through a variety of digital and traditional channels. In addition, the billboard is currently being repurposed as a rain catcher in a community garden near the company’s North Carolina headquarters, which is completely in line with the brand’s environmentally friendly image. In fact, the entire marketing campaign reflected this conservational image since it saved people money by showing them how to save their skin. For creative billboard design, contact MDG Advertising. At MDG Advertising, a creative Florida advertising firm with offices in Boca Raton and New York, NY, our 360° marketing approach uses just the right mix of traditional and online media to reach your marketing goals. While some industries may fare better in print and others online, we strive to create a balanced approach where digital and traditional advertising efforts support each other and your marketing message is tailored to the medium. To stay on top of the latest trends in billboard design, contact MDG Advertising.